Take a look at this slide. It’s all about hope and building a better future. 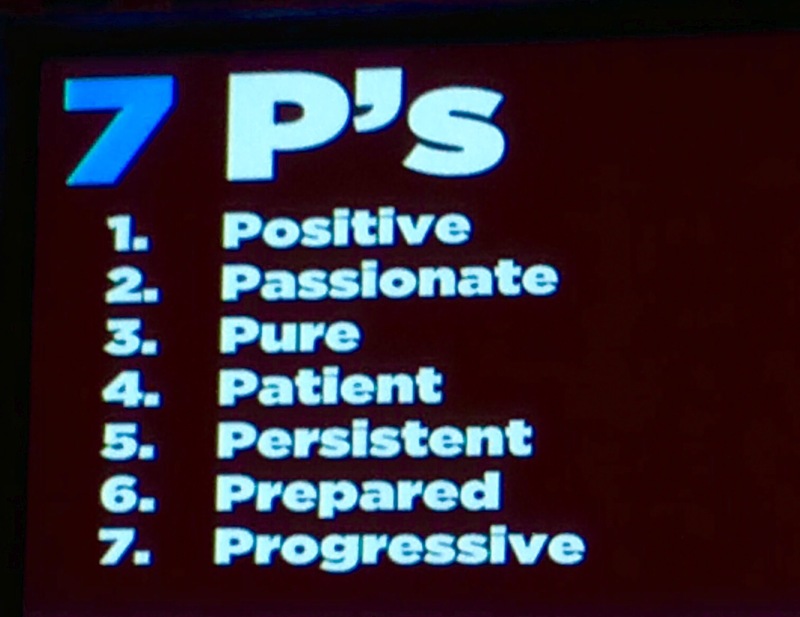 The 7 P’s were for podcasters who gathered recently at Podcast Movement, an annual industry conference held in Texas. As I’ve written before, the event was a rally: a celebration of what we do in podcasting. The message was overwhelmingly positive. But have you ever wondered why the language used to discuss business and politics are so different? When company profits or sales are down, ideas are shared about how to change course. At the best institutions and firms, innovation and fresh thinking are encouraged, especially when times are tough. Not politics. Outage and disgust are Donald Trump’s currency. Instead of offering a detailed, well-thought out vision for the future, what we get are furious outbursts and personal put-downs. Much of the news media only make it worse by feasting on controversy and highlighting the day’s most outrageous comments. That’s why my friend, Jim Meigs and I decided to do “How Do We Fix It”. Both of us spent decades as mainstream media journalists, and we thought there was room for a show about solutions. So far we’ve done 14 weekly podcasts on matters that matter: From parenting and personal debt to politics and identity theft. The latest show came this week in response to the turmoil on Wall Street, when words like “fear”, “pandemonium”, and “panic” were being used to describe the stock market. 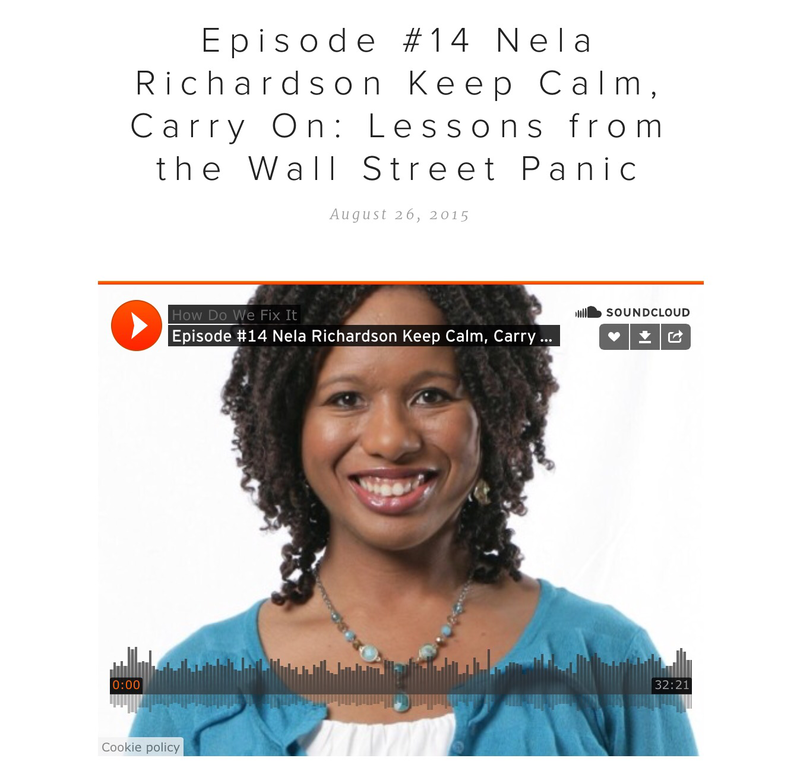 We were lucky when Redfin Senior Economist Nela Richardson promptly said “yes”, to our invitation to be the guest on our latest show. With rich experience in the private sector, academia, think tanks, and as a regulator, Nela is an economist who knows her stuff and can talk about it in an engaging way. One takeaway from our interview was “keep calm”. Compared to most overseas economies, the U.S is doing reasonably well. This week’s volatility was largely caused by fears of a sharp slowdown in China. On the other hand, interest rates are very low and inflation shows no sign of being a threat soon. Most millennials are patient, says Nela, and don’t appear to be in a hurry to buy their first home. But there are signs that more young adults are responding to the housing crunch in the most expensive markets on the coasts by moving to cheaper areas. “I think there are ways to acknowledge the new forms of households that we’re seeing growing up all around us.” Nela suggests that banks should be more creative about lending money to baby boomers and millennials who buy property with friends. “There is really no banking product that takes account of three or more household incomes.” Multi-generational households with more than two wage earners are quite common among Hispanics and some Asian communities. Another way for homebuyers and banks to respond to the changes in the economy is view rental income from spare rooms in a positive light. As urban areas expand, says Nela, local and federal home building policies should reflect the these changes. And better data collection will be needed to show where the needs and demand for housing will be greatest. Next week, we’ll be looking at another part of our rapidly changing economy: the jobs market. We’ll focus on fixes and real-world ideas for change. Want to find out more about “How Do We Fix It?” Head to our web page and sign up for “The Fixer”, our newsletter. ← Coca Cola vs. Science? The Sour Fight Over Sugary Sodas, And What You Can Do About It.